Hundreds of Ayrshire residents and visitors got a close up look at the London 2012 Olympic Torch when it came to Ayr – its only Ayrshire stop – as part of the Olympic Torch Tour. Within an hour of the specially designed exhibition truck opening, close to 200 people had already been to see the torch, and interest in it remained strong all day. The Torch Tour is also encouraging people to nominate their local heroes – and those chosen will join others carrying the Olympic flame through Britain next year, as part of the 70-day, 8,000 mile Torch Relay in the lead up to the opening of the Olympic Games. And, in keeping with the London theme, nominations could be made from the back seat of a specially converted London taxi – which featured a video booth! People who had already submitted nominations were encouraged to use the taxi and present a brief video supporting their choice. Visitors to the Torch Tour also had the chance to meet Scottish athlete and Olympic medal hopeful Caroline George (17) a pupil at South Ayrshire’s Belmont Academy. Caroline receives support from the Local Heroes programme, which provides funding and recognition to more than 100 Scottish Olympic and Paralympic hopefuls on their way to London 2012 and beyond. 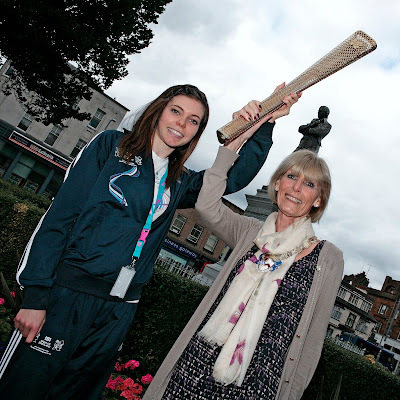 She said: “Having the chance to be part of the Olympic torch ceremony as it travels through Britain is a once-in-a-lifetime opportunity for me and I’m thrilled members of the local community can be nominated to carry the flame in the relay next year. 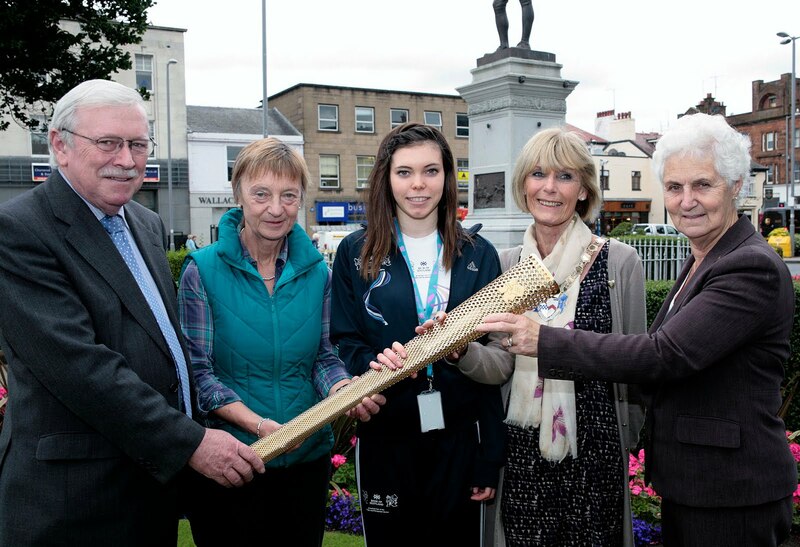 Joining Caroline with the torch was South Ayrshire Provost Winifred Sloan, Council Leader Councillor Bill McIntosh, Portfolio Holder for Economic Development, Tourism and Leisure, Councillor Margaret Toner and Councillor Nan McFarlane, Portfolio Holder for Social Services. Provost Sloan said: “I was thrilled to welcome the Olympic torch to Ayr and was delighted so many people of all ages and from all walks in life came along to see it, hold it and be photographed with it. During the relay, 8,000 torchbearers will carry the Olympic Flame across the UK. The detailed route will be announced later in the year and the aim of the London Organising Committee of the Olympic and Paralympic Games (LOCOG) is that 95% of the population will be within a maximum one hour journey time of the London 2012 Olympic Torch Relay.